As the signature element of the expanded convention center, the glass canopy over Pike Street is both a striking symbol and a blot on one of Seattle’s best public views. 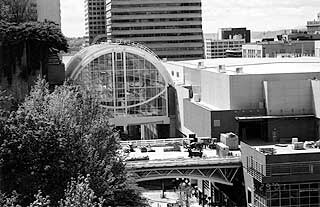 Photo courtesy of Lars Anderson, Kiewit Construction Co.
Three overhead elements span Pike Street — an arching glass canopy, an adjoining pedestrian sky bridge and a detached truck bridge (foreground). John Rahaim had just moved to Seattle to become executive director of the city’s design commission when the American Planning Association’s annual convention came to town. Naturally, Rahaim registered for the event, held at the Washington State Trade and Convention Center. The trouble was, he couldn’t figure out how to get into the place. As workers place the finishing touches on the convention center’s expansion, fans and critics alike agree: Nobody will ever miss the front door again. “From a public-use standpoint, it’s definitely an improvement,” says Rahaim of the convention center’s new look. Once visually timid, the convention center now flaunts its front door. As part of the expansion project, the center’s main entrance, previously buried in the middle of the block, occupies a well-defined corner at Seventh Avenue and Pike Street. It boasts outdoor seating areas, a greatly enhanced lobby and a much grander sign. Still, the debate about how well the expanded convention center reflects good urban design is not over what’s on the ground. Most of the buzz concerns what’s in the air. When it was decided to expand the center by building a sister facility on the north side of Pike Street, it became a given that a bridge or two over Pike would be required. That’s because center leaders wanted a direct connection between the original center’s exhibition hall — which sits four floors above the street — and the expanded center’s hall, says Chris Eseman, principal architect for the project. At that point, Eseman and his colleagues at LMN Architects, faced two choices. They could be apologetic in their design or try to make a statement. “We chose to celebrate it as opposed to being bashful about it,” says Eseman. The result has inspired both boos and ahhhs. Three overhead elements span Pike Street — an arching glass canopy, an adjoining pedestrian sky bridge and a detached truck bridge. By tying the new 105,700 square-foot hall to the existing 100,000 square-foot hall, the skybridge doubles the amount of contiguous exhibit space the center can offer, increasing its appeal to large events. In addition, the wide bridge with its vaulted ceiling can serve as a gathering place in its own right. The truck bridge is equally utilitarian. A ramp already leads from the street up to the original exhibition hall. Thanks to the bridge, trucks can climb that same ramp to reach the loading dock at the new hall. The canopy — also referred to as the galleria — is where LMN most flamboyantly “celebrated” the spanning of Pike Street. While not vital to the center’s basic mission, the canopy creates a dramatic visual signature and establishes a unique new public space below, says Eseman. “There’s a tremendous amount of excitement about it,” he says. Steinbrueck, himself an architect, complains that the aerial structures sour one of downtown’s sweetest views — a straight shot down Pike Street from Capital Hill to Elliott Bay. From the west side of the convention center, the view remains uninterrupted, but from the east side, it’s scarred by the crossings, he says. Eseman admits the crossings are controversial, but says they sit high enough to provide a clear view by looking underneath them. Jill Janow is chair of the Pike/Pine Urban Neighborhood Council, a city-sponsored citizens group that represents residents east of the convention center. Like Steinbrueck, Janow believes the bridges and galleria are big mistakes. Not only do they spoil the view, says Janow, but along with the expanded center itself, they divide downtown from neighborhoods to the east. “That was a gorgeous view and it’s been replaced by something we feel causes a break in the city,” she says. Brought into the design process late, Janow says the Pike/Pine Neighborhood Council was concerned about how the center, which is oriented west toward downtown, would look from the back side, which faces east. While still critical that the center’s west side presents a friendlier face than the east side, Janow says the final design is improved over original versions. “Everybody’s consciousness was raised when we raised a public outcry,” she says. That’s because it is. As part of the convention center expansion, a new office tower was built adjoining the original center and a new hotel was built adjoining the expanded center. In addition, the Museum of History and Industry eventually will occupy the northeast corner of the expanded half. Physically, the expansion project is so near competition it leaves little to the imagination. But the structures won’t come to life — and a final grade can’t be assigned — until the halls, lobbies, sidewalks and shops are filled with people, says Eseman.